“Strawberry”, a fruit that all love to eat. Strawberries are rich in anti-oxidants which help in getting soft and glowing skin. They contain salicylic acid which helps to get rid of acne or pimples. It helps in maintaining your skin tone, improve skin texture etc. Do you know it can be used as a beauty product also. How? Lets see some beauty packs which are made from strawberry. Take some ripe strawberries and turn them to pulp. Then add 2 tablespoons of fresh milk and 1 tablespoon of fresh cream to it. Apply the mixture on your face gently and then massage with your hands. Let it settle for 15 minutes and then wash off with warm water. 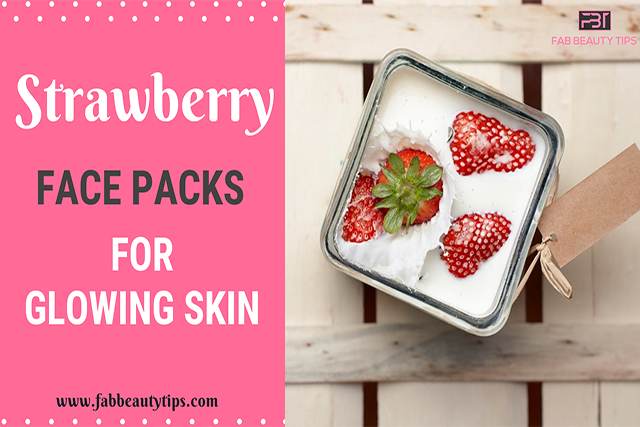 This strawberry and fresh cream face mask help to get rid of acne. Take 4 ripe strawberries and mash them properly. To the freshly prepared lemon juice, add the mashed strawberries. Then apply to your face for about 10 minutes and then wash with fresh water. This mask can be applied twice a week and is helpful in removing blemishes. Blend 5-6 strawberries and shift it to the bowl. Add 1 tablespoon of honey and cocoa powder to it. Gently mix the ingredients and then apply directly to your face. Let it sit for about 15 minutes and then wash. This mask helps to get the softer skin. Blend the strawberries in order to get a smooth paste. To this paste, add 1 tablespoon honey and stir the paste. Apply this paste on your face and let it settle for about 10 minutes and then wash with lukewarm water. This mask is quite effective for those having the dry skin. Mash 2 bananas and 4-5 strawberries in a bowl. Add half cup of sour yogurt to it with ½ tbsp. honey. Apply this mixture on your face and leave for about 15 minutes and then wash off your face. This banana and strawberry mixed face mask brings glow to your face. Take 2 tablespoon of rice flour in a bowl, blend the rice flour with 5-6 ripe strawberries properly. Apply this paste on your face for 15-20 minutes and then wash with lukewarm water. This mask provides softness to the skin. Cut the strawberry in two pieces. Scrub your face with the cut parts of strawberry gently on your face. Strawberries contains alpha hydroxyl acid which helps in shedding off the blemishes. Take 4-5 strawberries in a small bowl and then convert them to the pulp. Add 4-5 drops of the rose water to it. Then spread it over your face. Wait for 10 minutes and then wash with fresh water. This pack helps in treating the sunburn. Mix 2 tablespoons of blended strawberries, 1tbsp of honey, 1 egg white and 1 teaspoon of lime juice properly. Apply this to your face. This will help tightening of the skin pores and will provide glow. Make a puree form of 3-4 strawberries, add 2 tablespoons of yogurt and mix properly. Then apply on your face and leave for 30 minutes. Yogurt contains vitamins which help in getting glow on to your face. Take a cucumber, cut it into pieces and you can take 3-4 pieces of it. To this add 3-4 strawberries and blend the mixture. Refrigerate the obtained mixture for at least 1 hour and then apply on your face. Let it get dry and then wipe out with cold water. This pack helps in removing dark spots. Mash strawberries along with the 1 tablespoon honey and aloe-vera gel. Mix the ingredients and prepare a paste and then apply on your face. Firstly, massage for two minutes and then leave for 15 minutes. Wash off with fresh water. Aloe vera helps in treating the sunburn.